Losing weight is easier when you include enjoyable, low-calorie foods in your regular diet. Figs are slightly sweet and satisfying fruits that can be a regular part of a diet for weight loss, and including these fruits in your meal plans can help you stick to them without feeling deprived. Consume them as part of a calorie-controlled, balanced diet for best results. Each large fig weighs 2.2 ounces and contains 47 calories. Reducing your calorie consumption so that it is lower than your calorie expenditure can lead to weight loss, and figs can be low-calorie snacks that help keep you full and prevent you from turning to higher-calorie foods. Figs are higher in calories than some other kinds of fruit, however, and you might consume more calories than you had intended if you serve yourself the same size portion of figs as you would lower-calorie fruits, such as cantaloupe or oranges. Because of figs' sweet taste, you can serve them instead of sweets that contain high amounts of added sugars. 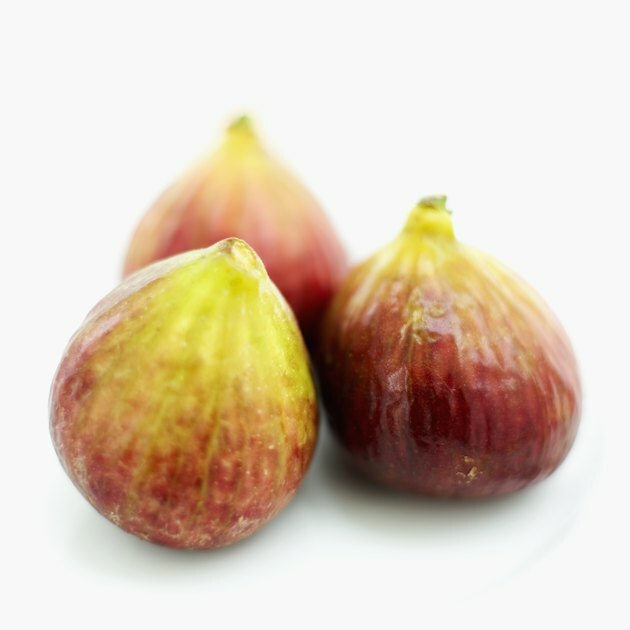 To help you lose weight, choose figs for dessert instead of sugary fruit pie or other baked goods. A single slice of cherry pie from a 9-inch pie contains 325 calories. For an afternoon snack, select a fig and a low-fat cheese stick instead of a high-carbohydrate, high-calorie choice such as a bag of cookies. Each large raw fig supplies 1.9 grams of dietary fiber, or 8 percent of the daily value based on a 2,000-calorie diet. Consuming a high-fiber diet can help prevent obesity, but most Americans do not meet recommendations for fiber consumption. Slice a fig into a bowl of whole-grain bran cereal for a high-fiber breakfast, or chop up a raw fig and toss it into a spinach and chicken breast salad to add a sweet flavor to a high-fiber lunch. Select fresh figs instead of dried figs or processed fig products. Fresh figs are lower in calories and sugars than dried figs, which have 93 calories and 18 grams of sugars per quarter-cup serving. Fig jam is a high-sugar option that is low in nutrients and high in calories, and it's a poor choice for a weight-loss diet. Processed fig bars are also higher in calories and added sugars than fresh figs, with 198 calories and 26 grams of sugar in a two-cookie serving. Can You Lose Weight Eating Peaches?